This is a set of 4 fabric coasters that measure about 4 inches square. 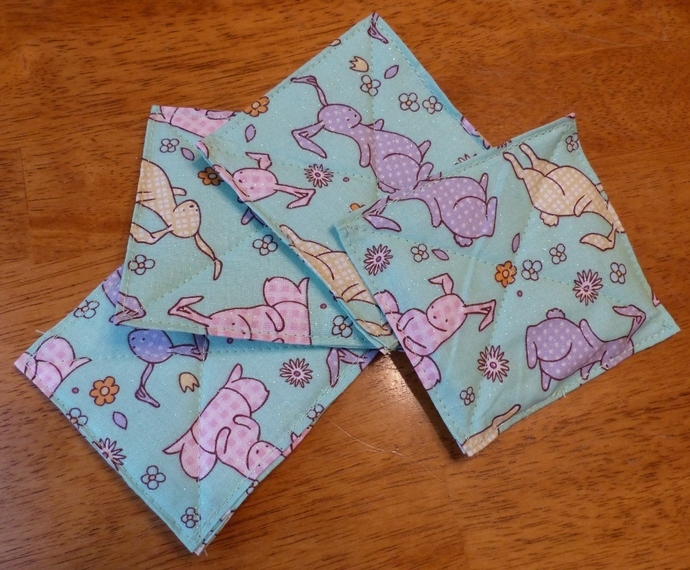 They are made in an adorable fabric of colorful floppy eared bunnies and are the same on both sides. Inside is an insulated layer to protect your surfaces from hot beverages. Spot cleaning would be recommended when necessary. Sizes will vary slightly since these are handmade by a human! The glass is for display only and is not included. These coasters would make a cute addition to the children’s table at your Easter gathering. These coasters are selling for $14.00 for the set of 4 plus $4.00 for standard shipping to the United States only. I will carefully package the coasters to protect them from damage during shipping. Please read my shop policies before ordering. Thanks for looking!